The St. Louis Post-Dispatch published a letter from me today which I wrote in support of a good newspaper editorial which had been attacked subsequently by letter writer Hugh Eastwood of St. Louis County. I said I agreed with his logic and it’s an argument I have used from time to time, but I’ve observed over many years that logic often doesn’t apply when it comes to the issue of secondhand smoke pollution, as was evident in the April 10, 2012, Post-Dispatch article featuring Jefferson County and its high smoking rate. 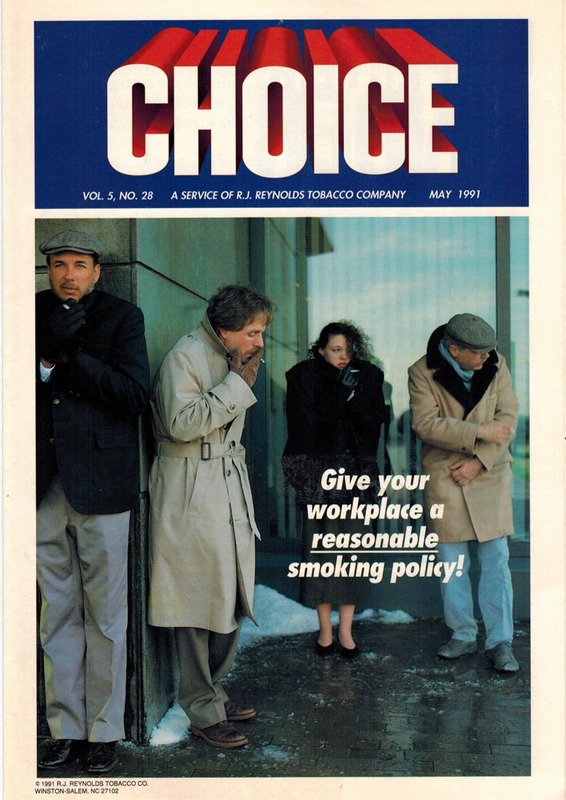 I mentioned in my letter the cover photo used in an R.J. Reynolds Tobacco Company’s “Choice” newsletter in 1991 and I’ve appended it below. The April 10 editorial “Rugged and addicted” was the most comprehensive and logical I have read for some time on smoking addiction and the related subject of secondhand smoke pollution. He also argued unconvincingly that secondhand smoke pollution was somehow unique when compared to other health and safety issues, such as food preparation or building codes, and should not be subject to regulation. Smoke-free air laws are not a “failed war on drugs,” as he alleged. And the attempt to dismiss Clayton’s smoke-free air law an attempt to “impress the middle class” is nonsense, given that similar comprehensive ordinances have been enacted in Ballwin and Brentwood, for example. David Venable, the former Arnold city councilman, deserved plaudits and not abuse from residents for sponsoring that city’s first modern smoke-free air ordinance. Mr. Venable and similar elected officials are public health heroes. I believe a “reasonable smoking policy” for workplaces is to make them smoke-free and offer employees help to quit smoking. Britney Morse (left), 20, and Julie French, 21, take smoke breaks after attending a court proceeding at the Jefferson County Court in Hillsboro on Monday, April 2, 2012. Both women began smoking as teenagers. Yet the health and safety examples cited are either long-standing examples of commercial or product regulation or liberty rights for the disabled, not novel government intrusions into individual free choices. Having suffered more than most from the failed war on drugs, perhaps the good people of Jefferson County just want to be left alone. After all, in such yoga-and-latte locales as Clayton, one is no longer able to epater le bourgeois. Your wife knows her French. @ Mogasp, If Nicotine were addictive would we not see people addicted to potatoes,tomatoes, eggplant etc. Should they not be regulated as a drug delivery device. They use to say tobacco smoking was habit forming until they found it useful to label smokers as addicts. Of course the label is everything to the enemies of freedom. mogasp comment: You can do better than this. Don’t need to. Facts and history back me up. Opioids are addictive in all forms whether ingested,smoked or injected. Nicotine only became classified as an addictive substance after the advent of anti-smoking groups and then only with the aid of activist in scientific clothing like Stanton Glantz. He and fellow activist got caught using pseudoscience in their 1992 EPA report, after getting caught instead of being barred from further research they were allowed to continue including writing subsaquent Surgeon Generals reports. Of course they only included a minor blurb on page 21 admitting to using the same questionable methodology. If nicotine were addictive, and all smokers really wanted, the patch or gum would completely satisfy smokers when they cease smoking. Simply put, they DO NOT, see any of Siegel’s blogs. On, the other hand, smokers of e-cigs were found to have little to none absorbed nicotine; yet e-cigs seem to satisfy ex-cigarette smokers, in a way that the patch and gum cannot. These indisputable facts prove anti-smokers claim that nicotine is addictive is NOT based on science, but also proves that their money really does come from Big Pharma makers of NRT products. – Otherwise antismokers would not vigorously defend the false claim that nicotine is addictive. By the way, if there were only 4 area people exposed to smoke and all 4 got lung cancer, MOGASP would be quick to claim that is proof smoke causes lung cancer in nonsmokers. Yet, when only 4 area politicians introduce bans and all 4 get defeated the next time they run for political office, MOGASP calls it a “myth” when I claim introducing bans is political suicide.